Welcome WHEELS to Last Hope. 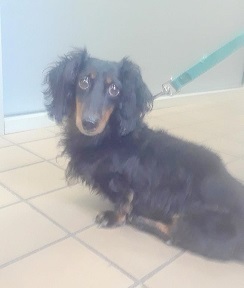 WHEELS is a purebred Longhaired Dachshund about 9 yrs old . The last month or so put him into a tailspin. His little body is on the mend now. Doxies are prone to back problems b/c of their long spines & short legs. In early Aug. a family turned him into Babylon Shelter saying they found this paralyzed dog in a box at the Copiague train station. A little dog detective work by the shelter proved these people had really adopted this Doxie at another LI town shelter some time ago. The people “fessed up” and said they didn’t want him any more b/c he ” woke up paralyzed”. They signed him over to the shelter. At first WHEELS was parslyzed. He dragged himself around by his front legs. Babylon Shelter had a donated handicapped dog cart that fit him perfectly. He would rocket around inside on the tiles…and could roll around outside too. Over the weeks his back healed, and WHEELS could walk again. The physical therapist at NY Veterinary Specialists said at this point he needed to stop using the cart. WHEELS moved to Last Hope yesterday. We hope to continue his PT especially underwater treadmill. WHEELS has the distinction of being the first homeless pet Last Hope took from the brand new Babylon Town Shelter at 80 New Hogheay, Amityville 11701. 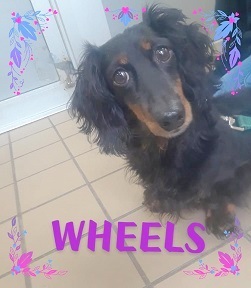 Meanwhile we are looking for a Doxie lover to embrace WHEELS in a FOREVER HOME. This entry was posted in Adopted, Adopted Dogs, Dog Center, Dogs, Male, Senior, Special Needs. Bookmark the permalink.